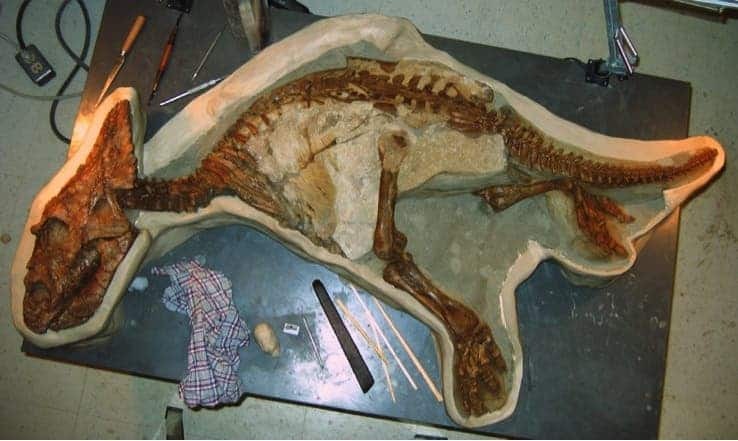 A newly discovered exceptionally well preserved 5 foot long Chasmosaurus Belli juvenile was discovered in an ancient riverbed in Alberta, Canada. The fossil is so well preserved that it actually left imprints of its skin on the rocks. The dinosaur was about three years old and paleontologists believe it probably drowned, and was buried and preserved by sediments. With a length of 4–5 metres (13–16 ft) and a weight of 2 tonnes (2.2 short tons), Chasmosaurus was a vegetarian of average size, and this fossil, aside from being remarkably well preserved, helps researchers understand several things about the species – like for example, the fact that they probably moved very slowly.